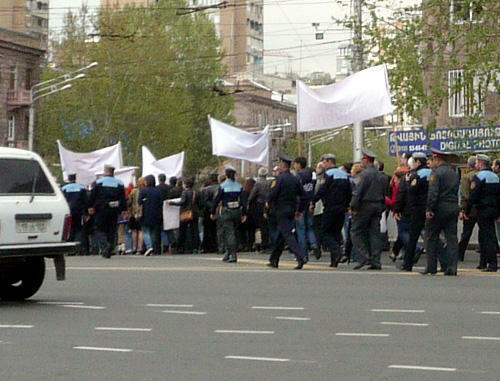 Armenian students who oppose the abolition of the right to defer from the army that is stipulated in the draft law "On military service and the status of serviceman" resumed their protest actions in Yerevan on November 13, Armenian media outlets reported. The new legislation is expected to abolish temporary exemptions from military service that many students of state-run universities have long enjoyed. In addition, the new law would limit educational opportunities for Armenian people. Armenia’s National Assembly (NA) adopted the draft law in the first reading on October 27. The bill caused a wide wave of public disapproval and discontent in the Armenian society. Moreover, students from the initiative "For the Development of Science" went out to protest and boycotted classes for a week. The students gathered in front of the Yerevan State University (YSU) building from the very morning and it has already been announced that today another protest march will take place. The representatives of the initiative "For the Development of Science" handed an official letter to parliamentarians on November 10 requesting to allow them to participate in the hearing of the bill, which was set to be held at the standing parliamentary committee on defense and security issues on the same day. Due to the lack of quorum, the meeting was postponed to Monday, November 13. After that, the students stated that they would meet again in front of the Armenian National Assembly building on Monday and try to take part in the meeting. However, the meeting of the commission on defense and security issues was held on November 10 at 9:00 pm. The commission approved the bill. A small group of students, despite the late hour, gathered near the National Assembly building to show their solidarity and interest in the bill under discussion. They also stated that they would continue the protests. The new bill provides for compulsory military service for all categories of students. The postponement of the army for educational purposes will be given only to those students who will sign a civil legal contract with the Defense Ministry. Under the new legislation, after completing studies in a bachelor's degree or through an integrated education system in accredited universities in Armenia, students undertake to perform military service in the designated units of the Armenian Armed Forces. At the same time, during their study period they must undergo military training. The service life in this case will last for three years, unlike the usual two. Thus, the ruling regime has taken another step towards the militarization of the Armenian society. Currently, Armenia is the third most militarized country in the world, and it seems that the country’s government seeks to advance to the first place in this ranking. If Armenia wants to strengthen its armed forces, then it should work on the quality of its military personnel, but not on the quantity, as the terrible hazing and lack of discipline are reigning in the country’s armed forces. Italian parliament not entitled to adopt resolution on so-called "Armenian genocide"
Cavusoglu criticizes Macron’s decision regarding so-called "Armenian genocide"